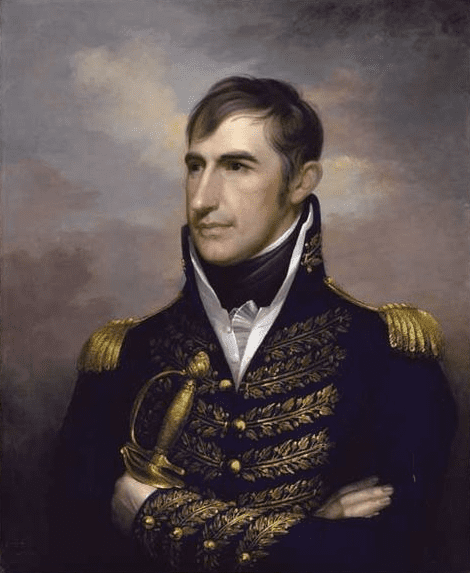 In the pre-dawn darkness of 7 November 1811, around 500 warriors of Shawnee Chief Tecumseh’s Indian confederation attacked a force of 1,000 men being led by Indiana Territory Governor William Henry Harrison at the Battle of Tippecanoe. Tecumseh had spent the past decade carefully building his Indian confederation to fight back against white encroachment on Native American lands, but the charismatic leader was away the day of the great battle. 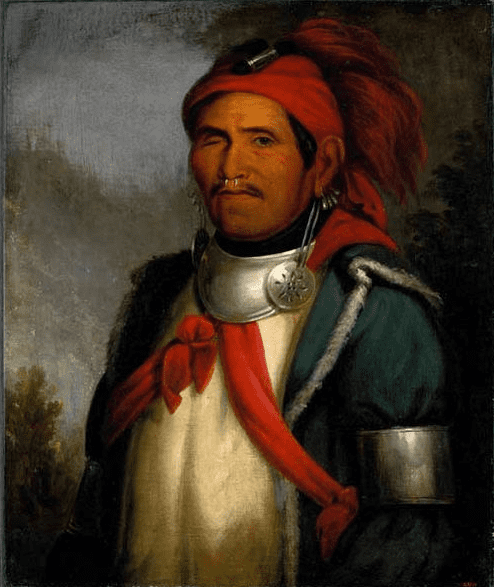 Painting: portrait of Shawnee Chief Tecumseh, by Benson Lossing in 1848 based on 1808 drawing. Credit: Wikimedia Commons. He was on an expedition recruiting allies from the Southern tribes, and had left his brother Tenskwatawa – the strange, mysterious man the Indians called “The Prophet” – in charge of the confederation’s large village near the Tippecanoe River. Before departing, Tecumseh had ordered his brother to avoid fighting the whites during his absence, as the confederation was not yet strong enough. The Prophet did not listen; he told the warriors his medicine would prevent the whites’ bullets from causing any harm, and urged them to attack Harrison’s men despite his brother’s stern warning. It had taken Tecumseh ten long years of powerful oratory and cunning diplomacy to build his coalition; his foolish brother destroyed it in two hours. Painting: portrait of Tenskwatawa, by Charles Bird King, c. 1820. Credit: Wikimedia Commons. The attack began around 4:00 in the morning; by the time dawn broke at 6:00 the Indians were defeated, fleeing back into the woods and abandoning their large village, called “Prophet’s town” by the whites. Harrison’s men had 188 casualties, including 62 dead, while the Indians lost 38 killed and around 70 wounded. Nonetheless, it was a decisive victory for the whites, as they held their ground, drove the Indians back, and burned the confederation’s large village the next morning – including all the Indians’ shelter, clothing and equipment and confiscating their winter food supply of 5,000 bushels of corn and beans. It was a devastating loss for the Indians, with their faith in The Prophet’s magic evaporated and the confederation’s will and spirit broken. Tecumseh returned two months later and tried to rebuild the alliance, but his momentum had been stopped and the confederation never regained its former strength. When the War of 1812 broke out seven months after the Battle of Tippecanoe, Tecumseh and what warriors still followed him joined the British. 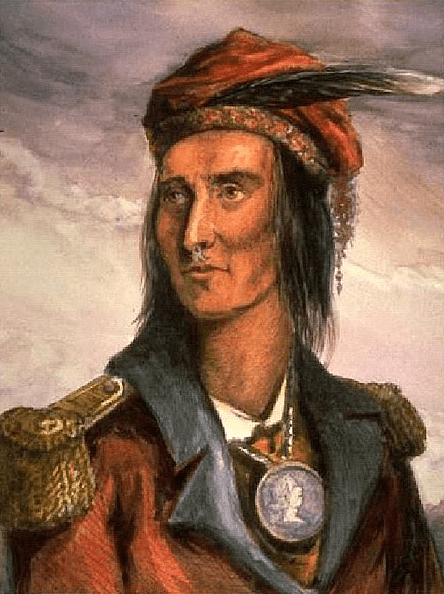 Tecumseh was killed trying to rally his warrior at the Battle of the Thames on 5 October 1813, after the cowardly British commander fled the field. The victorious American commander that day? None other than William Henry Harrison. Painting: portrait of William Henry Harrison, by Rembrandt Peale, c. 1813. Credit: Wikimedia Commons. Twenty-seven years later, Harrison won the election of 1840 to become the nation’s ninth president. His running mate was John Tyler, and Harrison used the campaign slogan and song “Tippecanoe and Tyler too” to rekindle voters’ enthusiasm for his landmark victory over Tecumseh’s Indian confederation. Extract of a letter from Governor Harrison to the Secretary of War, dated Head Quarters, near the Prophet’s Town, Nov. 8th, 1811. Sir – I have the honor to inform you, that the dawn of yesterday terminated an action between the troops under my command, and the whole of the Prophet’s force. Their precipitate retreat, leaving a number of the warriors dead on the field, and the subsequent abandonment of their town (which was partially fortified), attest for us a complete and decisive victory. It has, however, been dearly purchased. A number of brave and valuable men have fallen victims to their zeal for their country’s service. The behavior of the regulars and militia troops was such as would have done honor to veterans. I arrived at my present position (a mile from the town) on the evening of the 6th instant; a correspondence was immediately opened with the Prophet, and there was every appearance of a successful termination of the expedition, without bloodshed. Indeed there was an agreement for a suspension of hostilities, until a further communication should take place on the next day. Contrary, however, to this engagement, he attacked me at half past four o’clock in the morning, so suddenly, that the Indians were in the camp before many of the men could get out of their tents. A little confusion for a short time prevailed, but aided by the great exertions of the officers, I was soon enabled to form the men in order. The companies which were hard pressed were supported, several successful charges made, and about daylight, the enemy were finally put to flight. Our killed and wounded amount to 179, of these 42 are now dead. I have not been able to ascertain the number of Indians in the action. It must, however, have been considerable. The principal chief of those Potawatomies who have joined the Prophet is wounded, and in our possession. I have taken care of him, and shall send him back to his tribe. At a more leisure moment, I shall do myself the honor to transmit a more particular account of the action, and of our previous movements, and am, with the highest respect, sir, your humble servant. We stop the press to announce the important intelligence brought by Doctor John M. Scott, who arrived this evening directly from Vincennes [capital of Indiana Territory]. This gentleman has politely favored us with the following particulars, of a BATTLE between the Troops under Gov. Harrison, and the Indians. Capt. 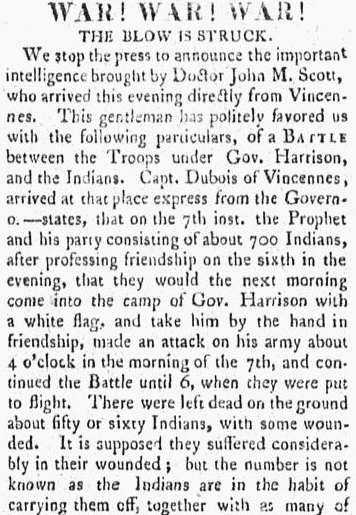 Dubois of Vincennes, arrived at that place express from the Governor, states, that on the 7th inst. the Prophet and his party consisting of about 700 Indians, after professing friendship on the sixth in the evening, that they would the next morning come into the camp of Gov. Harrison with a white flag, and take him by the hand in friendship, made an attack on his army about 4 o’clock in the morning of the 7th, and continued the Battle until 6, when they were put to flight. There were left dead on the ground about fifty or sixty Indians, with some wounded. It is supposed they suffered considerably in their wounded; but the number is not known as the Indians are in the habit of carrying them off, together with as many of their dead as possible. The Governor sustained an injury, as report says, of about one hundred and twenty. Some say there were 160 or 170, killed and wounded. 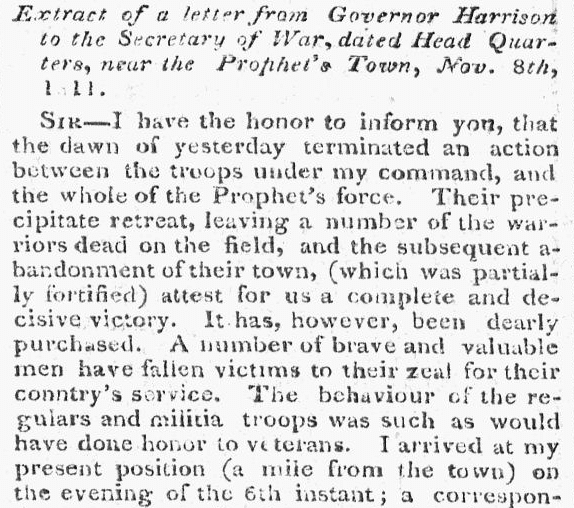 The Governor in a letter to Doctor Scott states… that the Prophet’s town was burnt on the morning of the 8th inst. ; the corn, amounting as was supposed to 5000 bushels, taken or destroyed – that he expected to commence his march on the 9th to Vincennes, but it would be slow on account of the wounded, and the precautions necessary to prevent annoyance from the enemy. Capt. Dubois reports… that the troops under the Governor’s command behaved with great bravery. Too much cannot be said in favor of Col. Boyd’s regiment of regulars, and Major Floyd’s detachment, who sustained the heat of the action, and acquitted themselves like heroes. Indeed the whole army did wonders, considering the disadvantages under which they labored; for an attack was not contemplated by the troops generally, after the profession made by the Indian Chiefs on the 6th. That Col. Daviess lived nine hours after the action; and that Capt. Bane of the regular troops was not dead, but expected to die every moment from his wounds; that the Governor received a shot through his hat which scratched the skin on the side of his head, and his horse wounded. Judge Taylor, of Jeffersonville, by the side of the Governor, had his horse killed, which fell on him, and he remained in that situation until relieved by a person pulling the horse off him. It will be particularly noticed, that the troops under Gov. Harrison did not exceed the number of the Indians at the time of the engagement, he having been obliged to leave troops at the different forts on his way up. Don’t You Wish the Census Had Pictures of Our Ancestors? Thank you; I’m glad you enjoyed it. Good work on providing the world with an excellent historical account of the Battle of Tippecanoe. Since 1945, my family has owned 1.39 acres of property along the Wabash River bluffs in the historic area that was Prophets town. It is a very spiritual place. The Prophet knew this too. I camped there in my youth when my mind was still open to seeing all of our creator’s natural elemental spirits in the water, trees, wind, fire, etc., before modern life’s TV and radio programming could close my mind. It is a magical place full of joy. My mom died in her beloved home in Prophets town on 9/12/17. She left on the wings of eagles who often land on a 250-year-old sycamore just north of Jewettsport bridge. It was the anniversary of Potawatomi trail of death passing through. She went with them. After her burial, we’ve been attacked by dark forces/black magic. Historians tend to play down the Prophet’s battle with witchcraft in the area called Battle Ground. But the Prophet wasn’t wrong. I’ll just say — bring your cats and dogs inside on any Blood Moon night!